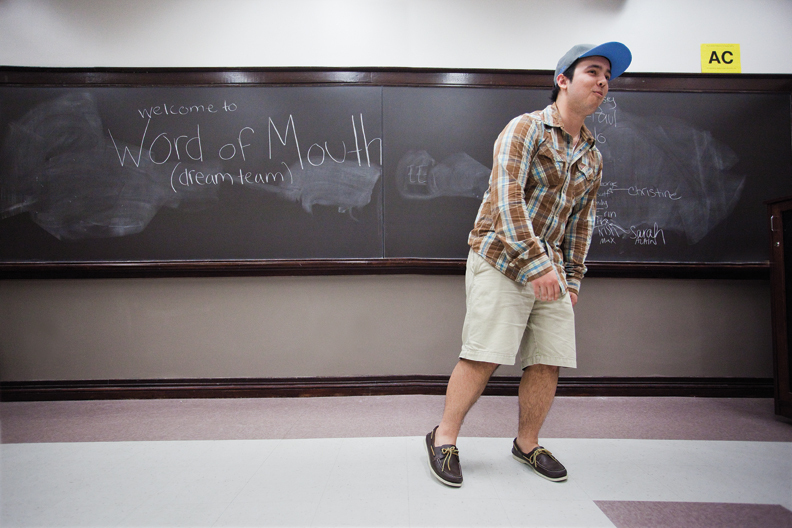 Word of Mouth president Max Ade ’12 takes his turn at the front of Gasson 303 on March 13. 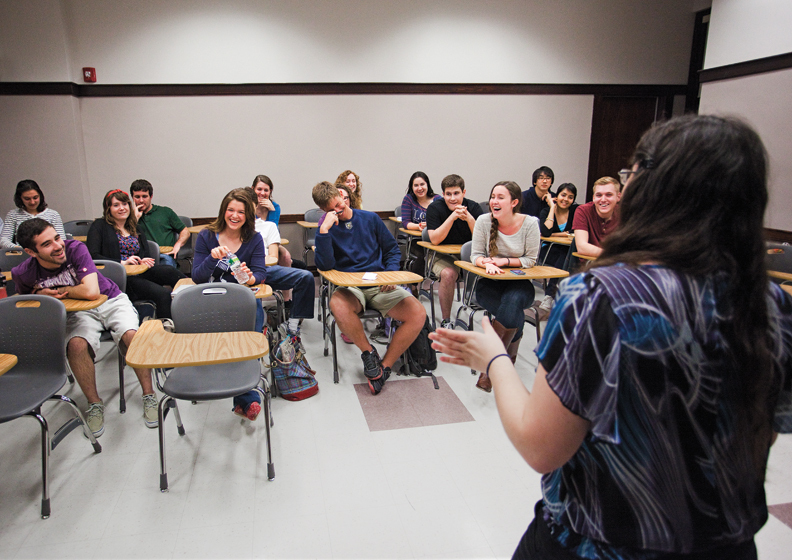 During the 2011–12 academic year, some 4,000 students will have participated in one or more of the approximately 200 clubs and organizations that are registered with the University’s Division of Student Affairs. 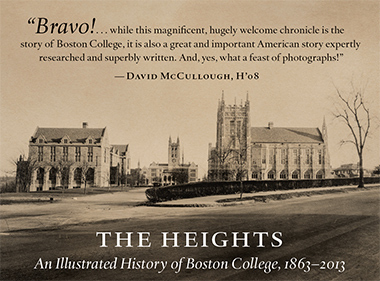 The oldest undergraduate organization is Stylus, Boston College’s literary and arts magazine, founded in 1882. 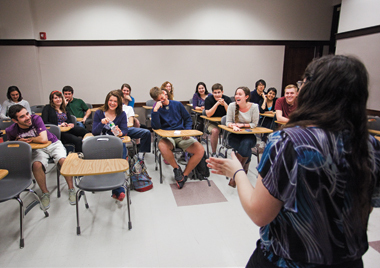 The latest to gain recognition (enabling officers to apply for University funding, book rooms for events, and use the Boston College name and tax status) is Global Zero of Boston College, part of an international group aimed at eliminating nuclear weapons, which was introduced on campus by Andy Hu ’14 in fall 2011. Thirty-eight Boston College clubs focus on academic matters (the Mendel Society, Political Science Association, Communications Academy), 21 are devoted to club sports (cycling, women’s rugby, karate), 15 to campus ministry (Hillel, Muslim Students Association, Asian Christian Fellowship), and 29 to cultural themes (Armenian Club, International Club of BC, Il Circolo Italiano). Many of these are common to college campuses anywhere—the investments clubs, ultimate Frisbee, model United Nations. Others perhaps less so: the groups devoted to Cape Verdean culture, mahjong, and liturgical dance, for instance. 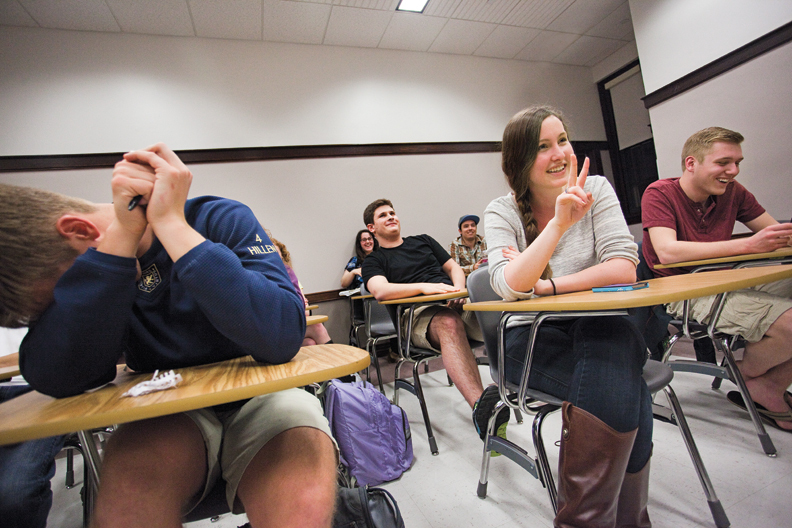 BCM photographer Caitlin Cunningham recently attended a few meetings. 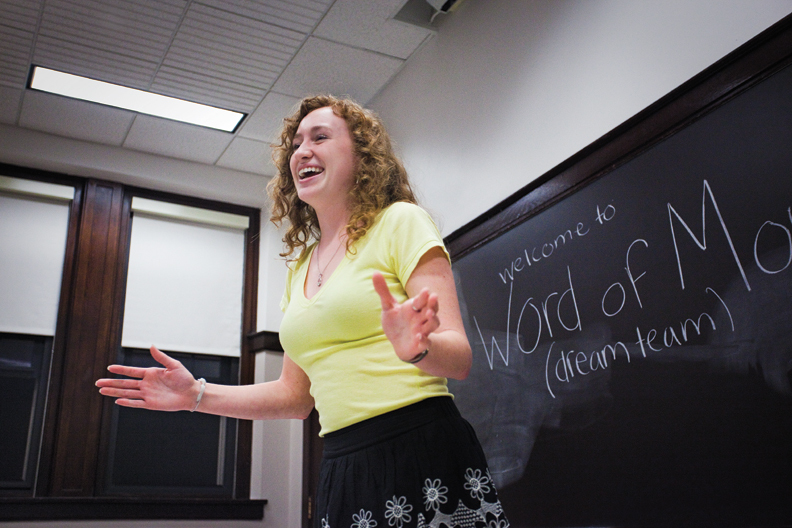 Click image to view a slideshow of a Word of Mouth meeting. Click image to view slideshow of a Fuego del Corazón rehearsal. The Latin dance troupe Fuego del Corazón (Fire of the Heart) advertises “salsa, merengue, hip hop, reggaeton, bachata, cha cha, flamenco, tango,” and more. 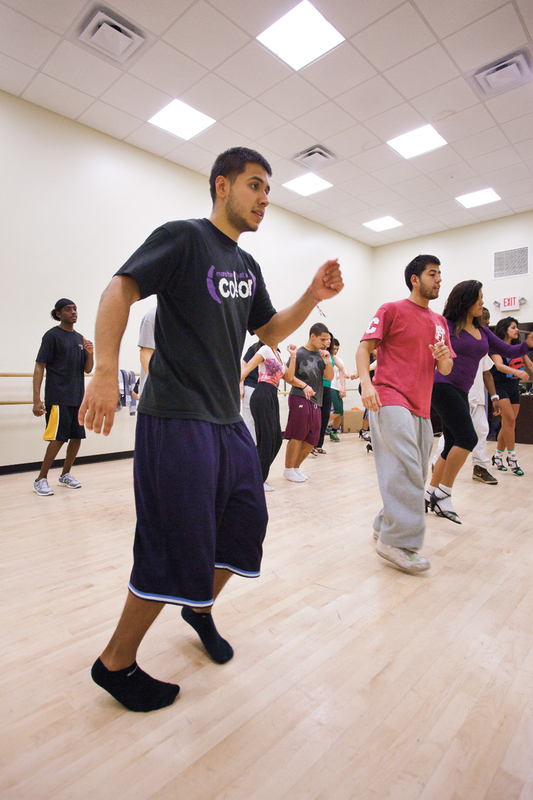 Fuego performs about nine times annually, on and off campus, but the highlight of its year is the AHANA Leadership Council Showdown, a competition among Boston College’s dance teams in the spring. Formerly held in the Flynn Recreation Complex, the event’s popularity compelled a move to Conte Forum in 2008. Fuego has won twice since then. 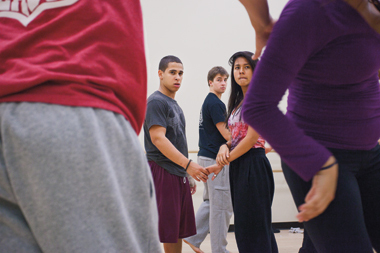 According to co-captain Carlos Contreras ’12, few who audition for Fuego bring much Latin dance experience “aside from family get-togethers and parties.” On March 17, with Showdown a week off, the performers worked on a section of their nearly 10-minute routine, designed by the group’s six captains, in a side room in the Brighton Campus dance studio. Normally they meet three times a week; practice now would be every day. Contreras called out the cadence—”one and two and three and four.” Movements were slow and sometimes tentative. Progress was halting as dancers asked about placement of an arm or the position of their feet. That changed when music—”Danza Kuduro,” a Portuguese/African/Latin cut—pulsed from a small set of speakers. The men’s steps were crisp and confident; the women’s twirls were dizzyingly fast, their leg kicks high. Hips were shaking, hair was flailing, and Fuego was in near-perfect harmony. 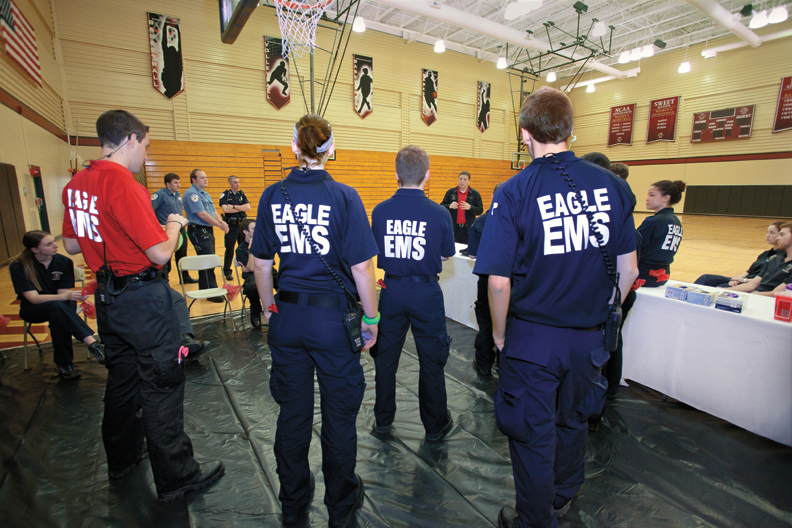 Click image to view slideshow of Eagle EMS preparing for the spring concert. “Does everyone have gloves? Pens? Bio-bags?” called out a young man in a blue jacket and red polo shirt. Two dozen emergency medical technicians (EMTs) of the student-run Eagle Emergency Medical Services (EEMS) crowded into their headquarters, a smallish room on the second floor of Maloney. Medical supplies from band-aids to defibrillators filled shelves along three walls. Shoulder bags and hardshell suitcases sat atop shelving and on the floor. It was mid-afternoon on April 20, and the EMTs were mustering in advance of the spring concert in Conte Forum. 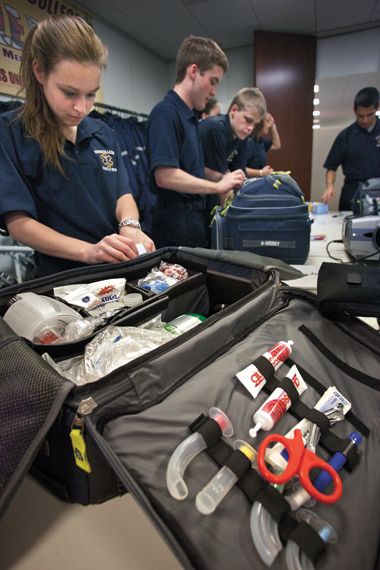 Teams of two matched medical kits against checklists. Others stuffed latex gloves into the pockets of their navy cargo pants. One EMT downed a late lunch of noodles as a roll of tape was tossed over his head. 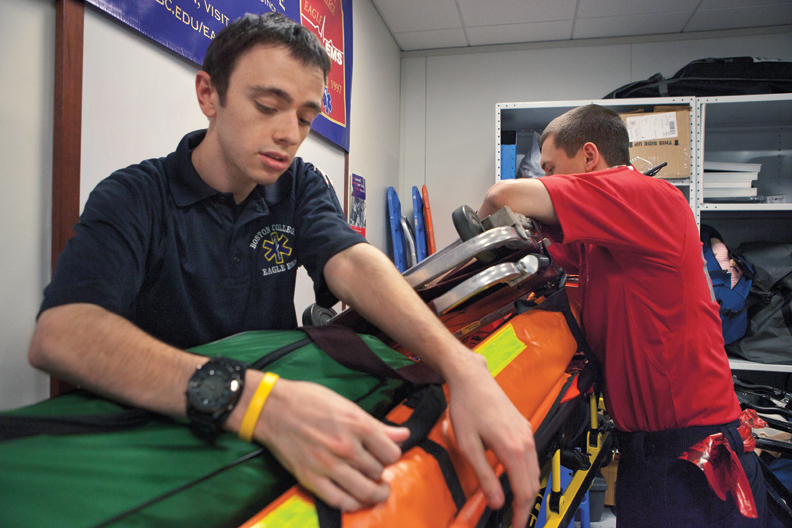 Ninety of the volunteers are state- or nationally-certified EMTs (the rest are “observers”—trained but not yet certified). 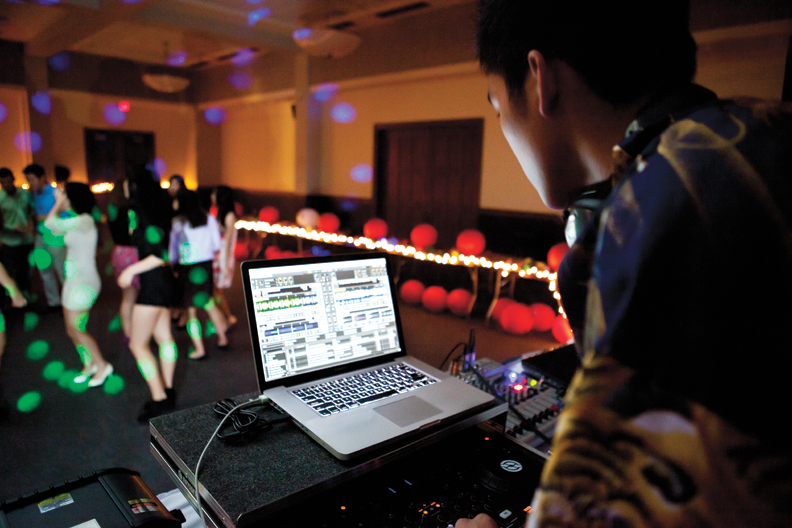 EEMS serves at some 300 campus events a year, in coordination with the Boston College police. 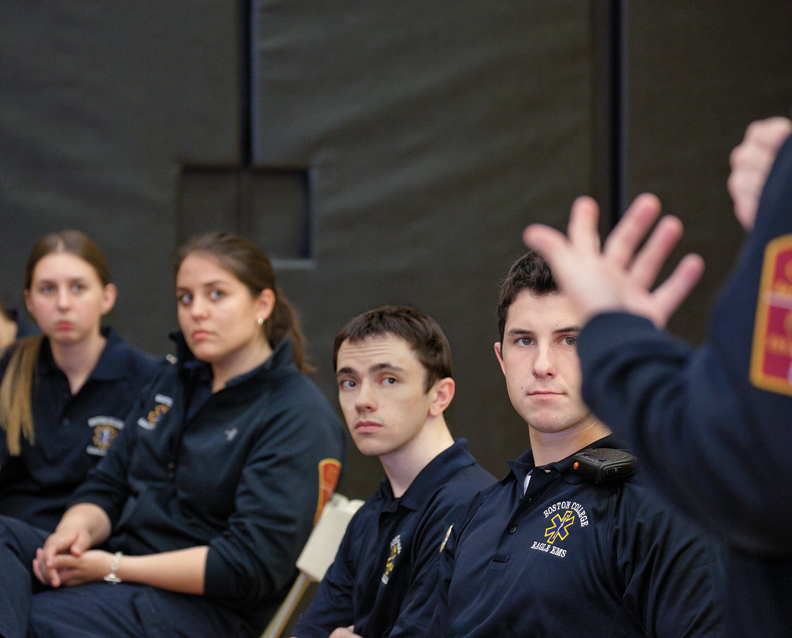 Its role, says president Chris Faherty ’13, is to “assess patients, initiate critical care, determine whether they need to be transported to a hospital, and if so, package them” for transport by an outside ambulance service. Faherty estimates EEMS will have provided 8,000 hours of medical coverage during the 2011–12 academic year and treated 600 patients. On weekends, 12 to 15 members are on call, day and night. An EEMS Thanksgiving dinner last November 24 fed some 50 members. 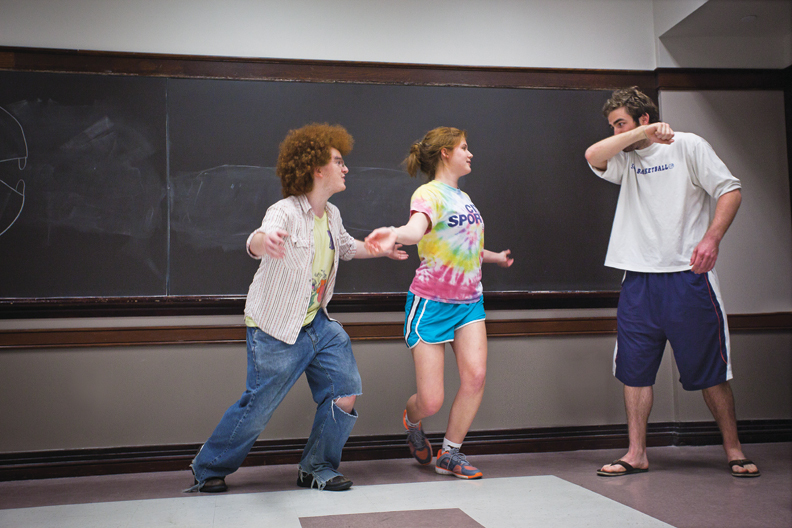 Click image to view slideshow of a Committee for Creative Enactments rehearsal. 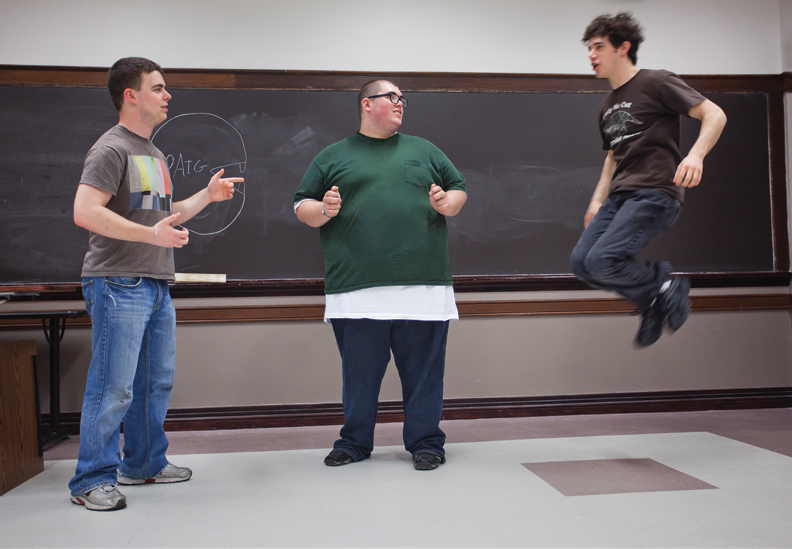 What began as a couple of friends playing a prepackaged dinner party game 24 years ago evolved into a full-fledged comedy and improv troupe. 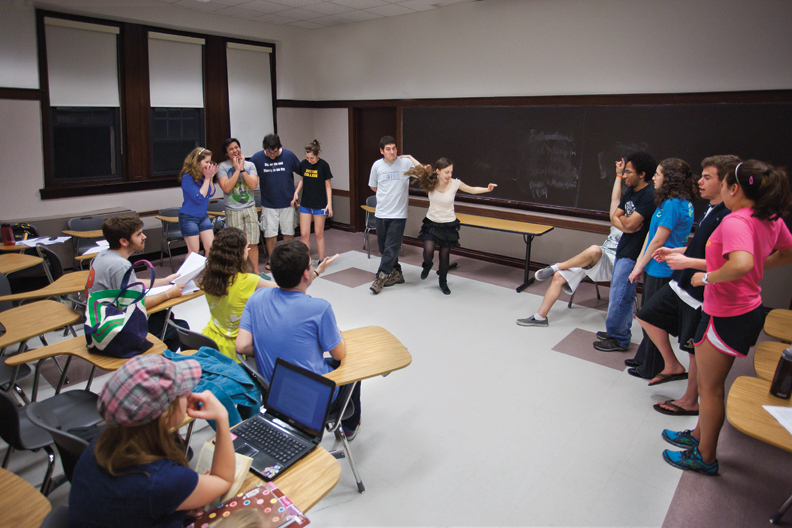 The Committee for Creative Enactments writes and performs two original murder mysteries a year and stages improv shows each semester. At 8:00 on an evening in late March, 15 members—including a singing detective, a plucky French maid, and a whiny, wordy ghost—occupied a Gasson Hall classroom, deep in rehearsal. At the front of the room, a young man poured imaginary glasses of scotch; another delivered an invisible tray of knives. Down the hall, members not in the play honed their improv skills, as Donald Chang ’12 offered his critique. “Don’t show your back to the audience,” he said to a trio who had just riffed on The Wizard of Oz. 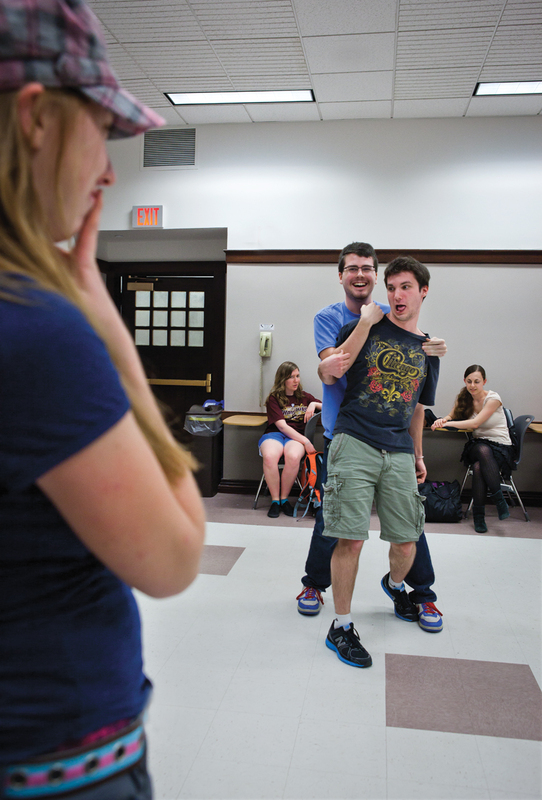 “Just don’t do it.” Although the improv exercises began as a way to develop comedic skills for the mysteries, CCE now competes annually in Improv Boston’s College Comedy Beanpot; its team won the wild card round (essentially, third place) this year. Committee president Colleen Vecchione ’12 says the club sticks with the murder mystery framework because of its versatility. “We’ve done westerns, video games, murder at a movie theater, a summer camp,” she says. “It’s a generally ridiculous theme to work on.” Murder at the Holiday Inn Express premiered at O’Connell House on April 27. Click image to view slideshow of an Electronic State of Mind dance party. 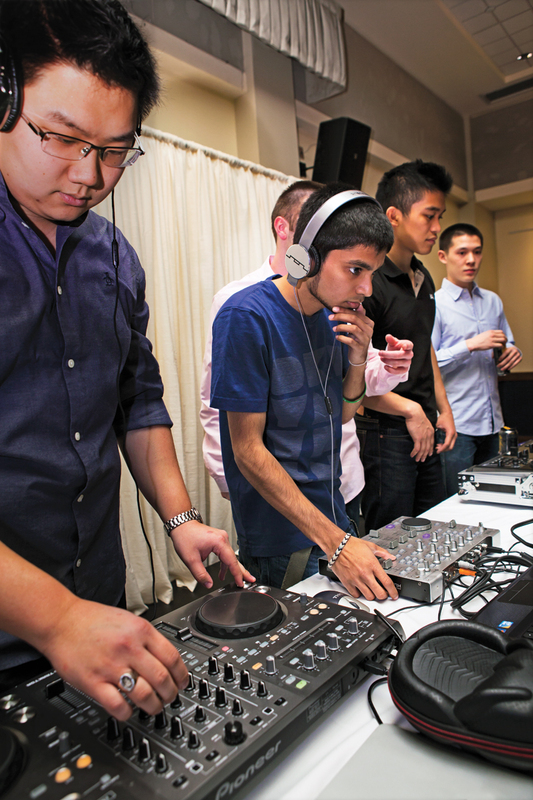 Beeps and tones backed up by a pounding bass line and blended with pop song hooks pulsated from the Heights Room on the second floor of Corcoran Commons on March 16. Inside, blinking colored lights and a green laser washed the room. 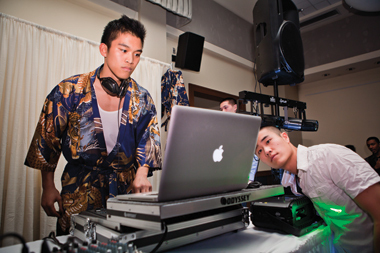 A charity ball sponsored by the Japan Club was underway, and four members of Electronic State of Mind (ESM), wearing headphones, were creating the soundtrack. Standing on a stage at the front of the room, they took turns monitoring laptop computers, adjusting dials on mixers and controllers to isolate vocals, and cueing up new tracks to form cohesive, fluid, hour-long sets. Clad in a floral kimono, Rodaan Peralta-Rabang ’13, ESM cofounder and copresident, hoisted a strobe light over his head. 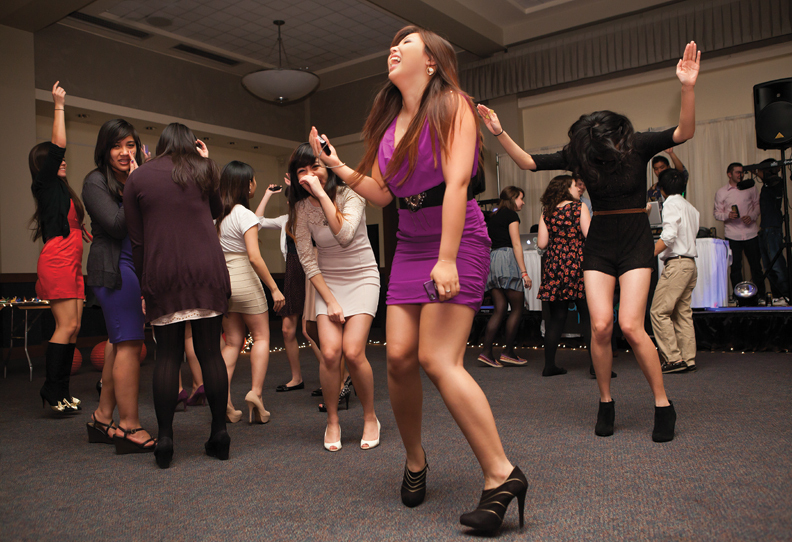 A few intrepid souls took to the dance floor, and the party was on.